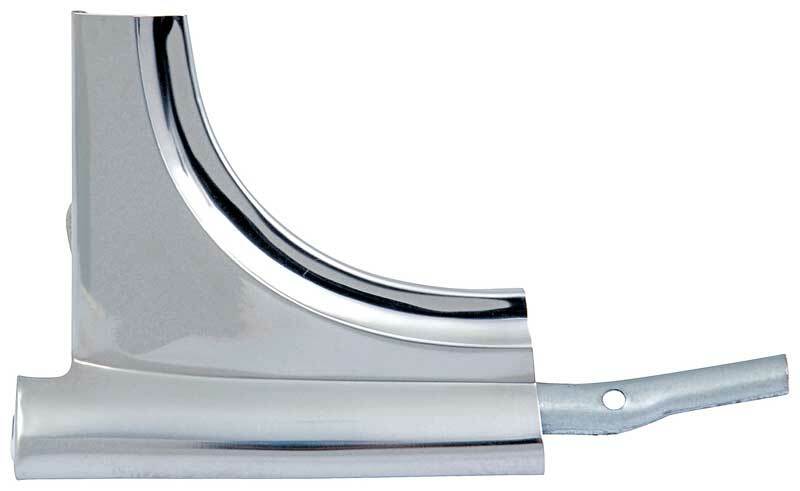 Classic Industries offers a wide selection of Moldings for your Chevrolet Bel Air. Classic Industries offers Chevrolet Bel Air Body Side Moldings, Chevrolet Bel Air Door Moldings, Chevrolet Bel Air Fender Moldings, Chevrolet Bel Air Front & Rear Window Moldings, Chevrolet Bel Air Hood Moldings, Chevrolet Bel Air Molding Clips & Fasteners, Chevrolet Bel Air Quarter Molding, Chevrolet Bel Air Rocker Moldings, Chevrolet Bel Air Roof Drip Molding, Chevrolet Bel Air Tailgate, Chevrolet Bel Air Trunk Moldings, and Chevrolet Bel Air Wheel Moldings. Reproduction door molding for 1956 Chevrolet Bel Air two door hardtop and convertible models. Features correct finish, contours and mounts just like the originals. Note: Can be used as either LH lower or RH upper. Reproduction quarter vertical fin moldings for 1957 models. Feature correct stainless finish, along with correct contours and mount just like the originals. When replacing your grill, it is often necessary to replace worn or damaged bolts/clips. This set is designed to mount the grill exactly as the original. Reproduction top fin molding clip sets for 1957 models. Manufactured to factory specifications, these are the clips that the pins on the fin moldings snap into in order to secure them to the vehicle. One set does one vehicle. These reproduction fender paint divider moldings for 1956 Chevrolet One-Fifty and Two-Ten models feature correct contours, finish, and mount using original style hardware. This reproduction quarter extention molding for 1955 Chevrolet Bel Air two door hardtop and convertible models feature correct finish, contours and mount just like the originals. 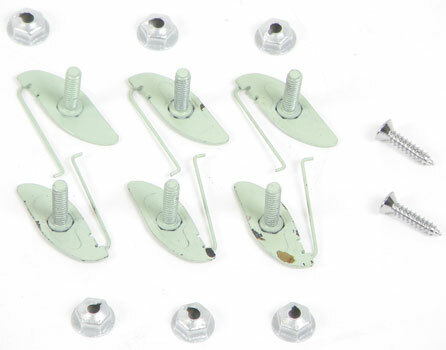 This molding connector for 1955-57 Chevrolet models is frequently damaged or lost when replacing the rear window. 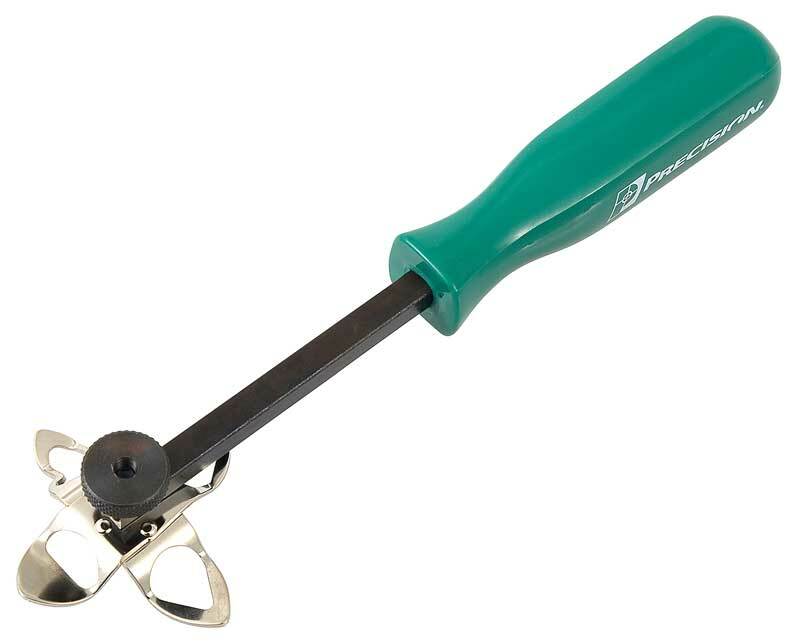 Features original contours and is high-quality stainless steel. Custom chrome fender louvers for 1957 Chevrolet models. A threaded stud has been added for easy access in cleaning and polishing. One set required per vehicle. Reproduction quarter belt moldings for 1955-57 convertible models. These are the moldings that are installed at the top of the quarter panel, and feature factory style contours and the correct stainless finish. Reproduction quarter extention molding for 1955 Chevrolet Bel Air two door sedan models feature correct finish and contours and mount just like the originals. Reproduction upper short curve quarter molding for 1957 Bel Air and 210 2 door models. Reproduction complete side molding set for 1957 two door Bel Air and 210 models. Manufactured to correctly replace all ten side molding pieces, featuring original style contours and bright polished stainless steel. Reproduction chrome window frames for 1955-57 Chevrolet Nomad models. Feature correct chrome plating and will mount just like the originals. Two required per vehicle. These heavy stainless steel windshield moldings are complete with cutouts for visor brackets and convertible top latch. Note: No further discounts apply. Reproduction quarter panel molding for 1955 Chevrolet Bel Air 2 door models.